Rune Bratseth (born March 19, 1961) is a former Norwegian footballer, who played as a sweeper. Nicknamed "Elk" due to his long stature, he is best known for his spell with SV Werder Bremen, also having appeared in the 1994 FIFA World Cup with Norway, its first since 1938, at the age of 33. One of the best players to come out of Norway ever, Rune Bratseth came from humble beginnings to become a world class defender, a legend in the Bundesliga and the first Norwegian ever to win a European Cup. So good was Bratseth in his prime, that the legendary Franz Beckenbauer, then German national coach, once said he would have liked to have Bratseth in his squad at the 1990 World Cup. Not bad for a player who nearly gave up football eight years earlier. In 1982, the 21-year-old Bratseth was playing part-time football in his native Trondheim for Third Division club Nidelv, and was thinking about quitting the game to consentrate on his studies. Then, he was discovered by pure coincidence by Rosenborg player Knut Torbjørn Eggen, who happened to be watching a friendly football tournament between Trondheim's religious communities, where Bratseth, a devout Christian, played for a team called Salem United, representing the Pentecostal Church. Impressed by his performance, Eggen persuaded Rosenborg to give Bratseth a trial. And the rest, as the saying goes, is history. Bratseth didn't take long to establish himself at Rosenborg. He became a regular in 1983, and was one of the key players when RBK won the League Championship in 1985. Still, it came as somewhat of a surprise that he was selected for the national team's training camp in the Caribbean in early 1986, where he made his international debut against Grenada. Later that year, following another excellent season at Rosenborg, he was given a trial by German club Werder Bremen, who liked what they saw, and quickly signed the player. It was at this club Bratseth would become one of the top defenders in Europe. Tall, fast, cool under pressure and with good technical skills for a defender, Bratseth became the first-choice libero at Bremen within weeks of joining the club, and his performances didn't go unnoticed back home. He soon became a regular in the national team, and was nearly always among the best players on the field. Among his many great moments for Norway was his fantastic goal against Cyprus in 1989, when he ran across the entire pitch, dribbled past four players, and fired the ball into the back of the net. In 1988, he played nearly every game in the Bremen side that won the Bundesliga, and Bratseth, nicknamed "Der Elch" ("The Moose") by the Werder supporters, was named the best foreign player in Germany. 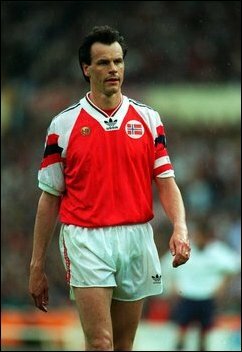 In 1990, now an indispensable player for both club and country, Bratseth was named captain of the national team, and he was a vital player in what was to become the start of Norway's golden age in the early 1990s. At club level, he won the German Cup in 1991, and the following year he became the first ever Norwegian to win a European trophy when Bremen won the Cup Winners' Cup. He added another medal to his collection in 1993, when Bremen once again won the Bundesliga Championship, and he was ever-present when Norway qualified for the 1994 World Cup. Still an excellent player, he then announced his intention to retire from football after the World Cup finals. The World Cup was a fitting swansong for a great player. Although Norway failed to get past the group stage (by the slimmest of margins), the captain was, along with Erik Thorstvedt, Norway's best player in the tournament, rock solid in defence. Despite obviously being good enough to keep playing for both Bremen and Norway, Bratseth kept his word, and retired after the 1994 World Cup. He finished his career with 60 caps for Norway, and 230 games and 12 goals for Werder Bremen. After retiring from the game, Bratseth moved back to Trondheim, and worked as Rosenborg's director of football from 1995 to 2007.